Watched a video in class a about is exhibition challenging space in the Turbine Hall. A huge empty space throwing voices at the onlookers through speakers. Everyone has a different experience as everyone hears different things from different angles. He uses his body by treating it like material for his art. “Flour Arrangements” “Feet of Clay” “Waxing Hot”. Signed people making them living sculptures. Objects have their own language and life becomes a way of art. 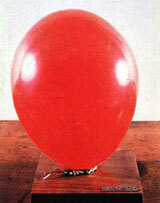 “Artists Breath” 1960 – balloon, wood and lead seals, breath now evaporated leaving behind the thought – as a deflated balloon. 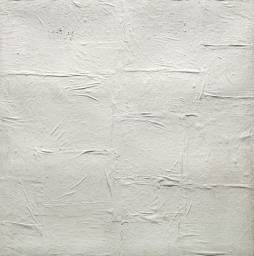 Manzoni wanted to banish narrative content from painting – he removed colour from his works. In 1957 he produced achromes which he described as “a single uninterrupted and continuous surface from which anything superfluous and all interpretative possibilities are excluded”. Pictures soaked in kaolin – (china clay used for making porcelan). This took the colour out of the desired ‘nothingness’ – weight makes the material sag. Born in 1933 to aristocratic family in Sonicino. Studied briefly at Brera Academy. Started painting landscapes in 50’s then began exploring with oil, wax, chalk, enamel and glue. Influenced by abstraction of Burri, Fonana and Jean Faultrier. Also dipped objects and imprinted in cavas (keys, scissors, pliers, pincers) and created pictures with petroleum and tar. In 57 he took part in a collective exhibition by fontana in Milan. He became a member of the Nuclear Group that disributed his manifesto for organic paintings. Invented ‘achromes”‘ raw chalk which as then scratched or etched – ‘canvases covered in Kaolin’; “Felt and Polystyrene”; “Wool and Rabbit Fur”; “Bread and Stone”. Left Nuclear Group in 1959 and started working alone. Became aquainted with Agostino Bonalumi, Agnetti and Castellani – published magazine”Azimuth”. EGGS – 1959 “Consumazione dell’arte” – distributed hard boiled eggs signed with a finger print and invited the public to eat them. A parody of mass production. LIVING SCULPTURES – ‘Del nulla, contro nulla’ – Of nothing, against nothing. In looking at the many books and references to Conceptual Art there are many different interpretations but they all lead to the same conclusion – that ART IS IN THE EYE OF THE BEHOLDER. It was considered the point at which the conception of artwork whether visually or spatially was most directly challenged. The first recognised conceptual art exhibition was held between 5 and 31 January 1969. However, as far back as Rodin and his sculpture of “The Gates of Hell” we started to be introduced to contemporary expressionism. Degas used found objects – real horse hair for “Little 14 year old Dancer”. Medardo Rosso’s Golden Head showed Primitivism and Tribal Art as an influence and his use of wax over plaster. Cubism – Raymond Duchamp-Villon’ s “Horse” was made up from straight lines, arches, hollows, curves and spirals and were described as being ‘thrown together in pure sculptural energy’. 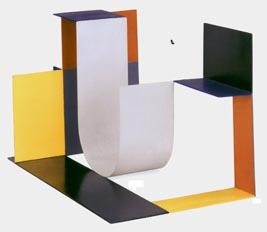 Constructivism – Russian artists interpreted sculpture as weightless objects floating in space. Duchamp created put the front wheel of a bicycle on a kitchen stool in 1913 – 132cm high and 64.8cm diameter and called it “Bicycle Wheel”. He was looking for a way out off art and unknowingly opened up a new dimesion in aesthetic consciousness. In 1917 Duchamp exhibited “Fountain” – a urinal signed by R Mutt. And in 1936 his “Bottle Rack” appeared in Charles Rattan’s “Surreaiste d’objects” in Paris. Duchamp re-emerged in the 1960’s when kinetic structures became central in art. 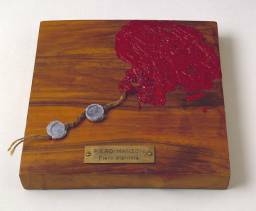 Assemblage Artists – William Sertz’s exhibition. Minimal Art – redefined the relationship between the viewer, object and the space – the viewer had to find their own response. Sculpture turned to new materials – gallery, street, sky, body or minds. Got to London on Saturday – and saw the Sickert exhibition at the Coulthart Centre, man was he a sicko – all the reclining nudes looked like they were lying in coffins and were very dead. Also went to the TATE to see the pop art portraits – Jasper Johns was great – so was Sarah Lucas but I’ve seen her stuff so often. It was made even more enjoyable by the old security guard constantly going up to people and whispering “that’s rubbish eh? anyone could do that with a coat hanger and a piece of string”.